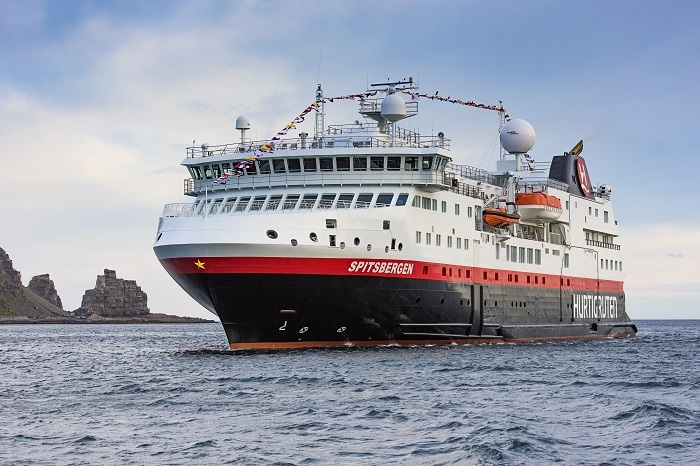 Yesterday, the much-anticipated christening of Hurtigruten’s new explorer vessel MS Spitsbergen saw a crowd of thousands gather in the town square of Svolvaer, a fishing village in Lofoten. The destination is one of the most spectacular in the world for adventure travel, and truly one of the highlights of the Hurtigruten Norwegian coastal voyages. The setting was picture-perfect, with the natural phenomenon of the Midnight Sun casting a magical light on the event as the ship’s Godmother, Norwegian explorer Cecilie Skog, smashed a champagne bottle into its side. As one of the most merited contemporary explorers, with numerous achievements including expeditions to the North Pole and South Pole, Mount Everest, Antarctica, and Greenland under her wing, Skog is a great match for the new vessel. She’s also climbed the ‘Seven Summits’ to stand on top of the highest mountain on each of the earth’s seven continents, living and breathing everything adventure travel and Hurtigruten’s ethos represent. The ship is named after Spitsbergen, the largest island in the Svalbard Archipelago, located on the very northernmost part of Norway, next to the North Pole. The island is also where Hurtigruten’s founder, Richard With, first started explorer tourism in the Arctic in 1896, so it holds particular significance. She joins Hurtigruten’s fleet of explorer ships on Norway’s coastline, and will set sail on her first voyage from Bergen on 24 July 2016. “Adventure travel is one the fastest growing global tourism mega trends and Lofoten offers everything the new adventure traveller seeks: Spectacular scenery, authenticity, a unique history and atmosphere, and access to active nature-based experiences. Svolvaer in many respects mirrors the modern Hurtigruten, being a world leading provider of explorer cruises with activity, learning and sustainability in the core”, said Hurtigruten CEO Daniel Skjeldam. After spending her first season in Norway, MS Spitsbergen will alternate between the Norwegian coast and polar expeditions. From 2017, guests can sail with her to Greenland, Iceland, the Faroe and Shetland Islands, as well as to Arctic Canada. Here, passengers will discover L’Anse aux Meadows, a UNESCO World Heritage site where the first Vikings settlements were discovered in 1960. “Archeological findings suggest this is the place where pioneer explorer Leiv Eriksson went ashore and named it Vinland. Coming here and to the other historic sites with MS Spitsbergen, more than a 1000 years later, resonates with our Viking spirit and Hurtigruten’s pioneering ambitions”, added Skjeldam. The Vikings crossed the North Sea and landed on the British Isles. Although they are often thought of as barbaric raiders, they were also accomplished explorers and settlers. Between year 800 and 1000, the feared and fabled Vikings carried out a number of expeditions to explore the North Atlantic Ocean. This expedition follows a route described in the Vinland Saga. This expedition includes the chance to visit two national parks, several different settlements and intriguing cities. Along the way, guests will get to experience remarkable archaeological remains and get an insight into the interesting history of the Vikings. This voyage explores the unspoiled regions on both sides of Baffin Bay. From Newfoundland and Labrador in Canada; via the grand landscape of Baffin Island; to Greenland where guests can touch an iceberg with their bare hands and marvel at the power of nature in Ilulissat Icefjord. A unique Arctic expedition exploring the northwest coast of Greenland, along the edge of the Greenland Ice Sheet, which stretches 1,500 miles north, covering up to 80 per cent of the island. Guests can discover the spectacular and un-spoilt scenery of Greenland and visit Iceland’s capital of Reykjavik, and the charming Faroe and Shetland Islands. Mythical Iceland is the perfect destination for adventurers looking to explore wilderness, wildlife, history and settlements.